Leader of the Pharisees in the first century B.C. ; president of the Sanhedrin before and during the reign of Herod. He and his colleague Abtalion are termed in Pes. 66a the "gedole ha-dor" (the great men of the age), and ib. 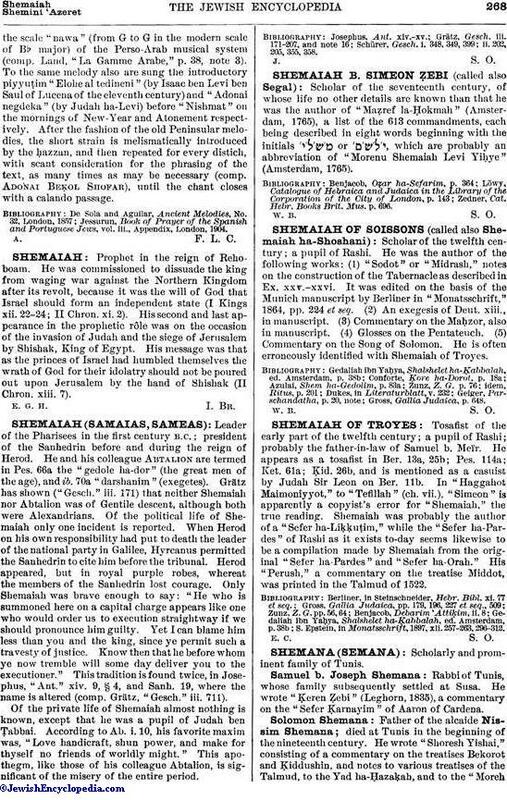 70a "darshanim" (exegetes). Grätz has shown ("Gesch." iii. 171) that neither Shemaiah nor Abtalion was of Gentile descent, although both were Alexandrians. Of the political life of Shemaiah only one incident is reported. When Herod on his own responsibility had put to death the leader of the national party in Galilee, Hyrcanus permitted the Sanhedrin to cite him before the tribunal. Herod appeared, but in royal purple robes, whereat the members of the Sanhedrin lost courage. Only Shemaiah was brave enough to say: "He who is summoned here on a capital charge appears like one who would order us to execution straightway if we should pronounce him guilty. Yet I can blame him less than you and the king, since ye permit such a travesty of justice. Know then that he before whom ye now tremble will some day deliver you to the executioner." This tradition is found twice, in Josephus, "Ant." xiv. 9, § 4, and Sanh. 19, where the name is altered (comp. Grätz, "Gesch." iii. 711). Of the private life of Shemaiah almost nothing is known, except that he was a pupil of Judah ben Ṭabbai. According to Ab. i. 10, his favorite maxim was, "Love handicraft, shun power, and make for thyself no friends of worldly might." This apothegm, like those of his colleague Abtalion, is significant of the misery of the entire period. Schürer, Gesch. i. 348, 349, 399; ii. 202, 205, 355, 358.